583-12.3.1 WOOD WORKMANSHIP. All wood members entering into the repair of boats shall be finished smooth on all sides. Uncaulked seams, joints, and faying surfaces shall be fair and in continuous contact when assembled. Caulked seams shall be fair and continuous and watertight when assembled with caulking compound. The outside of the hull shall be fair, free from tool marks, and sanded smooth. Wood members, when assembled in place, shall not be subject to stresses beyond their proportional limit as evidenced by any damage to the members. Any frames which show splitting or wrinkling shall be removed and replaced. Holes and loose knots shall be eliminated from wood components and members. Care shall be taken to eliminate as many defects as possible from rough lumber when laying out wood members before manufacture. 583-12.3.1.1 Setting Fasteners. Fastenings shall be set snug but not so tight as to weaken the material by rupture of wood fibers adjacent to the fastening. Lead holes shall be drilled for all screws and fetter ring nails. Diameter of lead holes shall not exceed 70 percent of the root diameter of screws for soft woods and 90 percent for hardwoods. For screw shanks, the hole in the material to be fastened shall be 100 percent of screw shank diameter. Holes for fetter ring nails shall be prebored not to exceed 60 percent of the nail diameter. Maximum depth of lead holes should not exceed 90 percent of the length of the screws. Screws shall not impact driven. The last 1/8 inch of screws are to be hand-turned or may be mechanically set, provided that the machines are equipped with a properly adjusted clutch stop device to prevent overdriving. Bolt holes shall be drilled for a tight fit. 583-12.3.1.2 Cleanliness. During repair, all chips, shavings, refuse, dirt, and water should be removed frequently. Dutchmen shall not be used as fillers for improperly cut materials. 583-12.3.1.3 Training Films. Information on techniques of laminating and steam bending of wood members is available in training films DN 24021, Laminating Marine Timbers, and DN 20543, Bending Oak Techniques. 583-12.3.2 REPAIR DETAILS. Damage to wood boats is commonly caused by mechanical and marine borer damage or decay deterioration. The first two causes for repairs are usually obvious upon inspection, but under certain circumstances decay is not easily detectable. Knowledge of the basic causes of decay will afford a ready means of recognition. 583-12.3.2.1 Decay. Decay in wood boats results either from inadequate ventilation or fresh water leakage and poor drainage. Both are preventable. Decay resulting from fresh water leakage and poor drainage is practically always associated with poor ventilation. 583-12.3.2.2 Inspection for Decay. Decay occurs in those portions that are poorly ventilated and where fresh water has gained access. For the most part, these portions are confined to the stem, transom areas, the region directly beneath the planksheer or cover board, and the bilge region in hulls having tight cargo flats. The headers beneath cabins and filler blocks also warrant careful inspection as does that portion of the frame and plank near the water line of hulls in fresh water service or storage. Chines, and the plywood beneath armor plating, bottom planking, and decking, should be closely inspected, particularly on hulls subjected to prolonged periods of uncovered storage. 583-12.3.2.3 Fungus Decay. Decay in boats by fungus growth usually is unrecognizable except in joints between faying surfaces. There are several aids to recognition that can be employed. For example, if paint coatings are discolored or the wood surface cupped, decay may be suspected. Tapping with a hammer will produce a dull sound in infected wood and is particularly useful in timbers which may have decayed interiors. A sharp ice pick or an oyster knife can be used to detect decayed wood by the ease of penetration and removal. Slivers turned up by picks or knife blade points tend to break off short instead of in long splintering breaks. Recognizable decay is most likely to be found near faying surfaces and joints. The condition of large timbers can best be determined by drilling with a 3/8-inch drill to two-thirds their depths. The ease with which the drill penetrates and the condition of the chips indicates advanced stages of infection. Thoroughly decayed wood is brittle when dry and breaks easily across the grain with a distinct brash fracture and may crumble into powder. Dry, sound wood breaks with more difficulty, giving an uneven, splintering fracture. Wet, sound wood merely bends. When prob ing with an ice pick or knife, it is well to remember that wet wood is softer than dry wood. It is also true that sound wood of low density is subject to brash failures. In doubtful instances, wood specimens can be submitted to a laboratory for positive determination. 583-12.3.2.4 Plugging Inspection Borings. Black stains spreading along the grain from ferrous metal fastenings are usually caused chemically by the iron contact instead of decay fungi and have much less adverse effect on strength. All holes bored for inspection purposes should be plugged with a dowel which has been soaked in preservative and allowed to dry. Dowels should be cut 1/64-inch undersize and coated with resorcinol glue before being driven the full depth of the drilled hole. Borings should never be of such a number or so located as to impair hull strength. Boring of chine, shelf, and clamp is not permissible. a. Open boats and decked boats in active service showed little decay. The repairs required were mostly for mechanical damage. b. Open boats in active service were practically devoid of decay repairs. c. Boats in open storage or boats stored under other than raintight, ventilated shelters necessitated over 90 percent of decay repairs. d. Boats that had always been in properly covered storage showed no decay. e. Decked boats from active service sometimes showed decay in those areas listed in paragraph 583-12.3.2 if ventilation was not sufficient or if fresh water had gained entry. 583-12.3.2.6 Confining Inspections. Confining the examination being made to those hulls, conditions, and locations which are most questionable, the thoroughness of the examination necessary to detect decay can be regulated and a fairly accurate estimate of the repairs required can be provided. 583-12.3.2.7 Wood Repair Techniques. Further information on wood hull repair techniques is given in Naval Sea Systems Command NAVSEA 0900-LP-015-1020, Volume 2 and NAVSEA 0900-LP-015-1040, Volume 4, Wood: A Manual for Its Use as a Shipbuilding Material . 583-12.3.3 DETERMINING EXTENT OF REPAIRS. Methods for determining extent of repairs required for wooden boats are discussed in the following paragraphs. 583-12.3.3.1 Boats from Open Storage. The inspection shall be thorough and include probing in all the areas listed in paragraph 583-12.3.2. A strake of planking or decking shall be removed to inspect the condition of the frame heads and beam ends (if present). Often decay will also be found just above the level where fresh water has been standing in the bilges. Removal of a plank at the turn of the bilges is the only sure means of detecting decayed or cracked frames at that level in single-planked, round bottom hulls. It is advisable, and usually cheaper, to strip landing craft to the framework. In short, if a boat has been subjected to open storage and is to be repaired, sufficient planking should be removed to afford access for a thorough inspection of all structural framing. 583-12.3.3.2 Boats from Covered Storage. All boats from properly covered storage require no more than a superficial examination by probing, as far as decay is concerned, provided no decay was present when they were placed in storage. 583-12.3.3.3 Boats from Active Service. Open boats from active service will show practically no decay and a superficial examination by probing is all that is required. 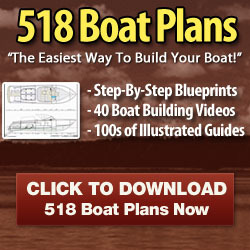 Decked boats require inspection in those areas listed in paragraph 583-12.3.2, particularly if it is evident that there is insufficient ventilation or that fresh water has access through opened deck seams or cabin moldings. It is advisable if decay is evident or if a small amount of probing reveals decay, to pull strakes of planking or decking to inspect the condition of the inner planking (if applicable) and the frame heads in the stem transom areas on one side of the hull. If decay is found, remove a midships strake at the same level and similar strakes on the opposite side. 583-12.3.3.4 Around Flotation Material. There is good reason to believe that flotation material will have no adverse effect on the hull structure provided it is properly installed (refer to paragraph 583-12.3.9). Until more evidence is accumulated, it is advisable to make a random check in the stemtransom areas, particularly at the frame head level, to ascertain that no deterioration has occurred. New and repaired boats from proper storage may be exempt from this examination. a. Use dry lumber and correct any feature apt to increase the moisture content of the lumber after installation, such as insufficient ventilation or fresh water leaks. There is no such thing as dry rot; decay fungi require moisture and air. Lumber below 20 percent in moisture content will not decay. Submerged lumber will not decay. The misleading term dry rot was derived from the dry and powdery appearance of wood that had decayed while moist and subsequently had dried out. b. Use all heartwood lumber of a decay-resistant species. Such species are necessary because of their dimensional stability, their slow rate of water absorption when submerged, and because of their usually lighter weight. Sapwood of any species has very low resistance to decay. c. Use preservative chemicals and fortified bedding compounds as a supplementary precaution. Such materials and salt water prevent decay by making the wood poisonous to fungi. a. Add well-placed port and starboard ventilators or extend the existing mechanical ventilation system to unven-tilated compartments. c. Correct any feature interfering with complete water runoff. 583-12.3.6 REPLACEMENT OF DECAYED WOOD. The most important consideration in the removal and the replacement of decayed wood is to find the cause for the decay and then correct it. In removing sections of wood, adding sister frames, or splicing, more end joints and faying edges are created providing additional places for moisture to collect. If the original cause of decay has not been removed, the chances for additional decay in the future will have been increased by the repair. Wood members that are extensively decayed should be removed entirely. 583-12.3.6.1 Preferred Repair Replacement Wood. Where decay is localized, removal of the decayed member should be to a distance of approximately 2 feet along the grain and 2 inches across the grain beyond the point where decay is evident. Heartwood of decay resistance species such as white oak, cypress, tropical American mahogany, teak, Douglas fir, longleaf yellow pine, Port Orford cedar, and Alaska yellow cedar are preferred for repair replacement. The selection must take into account the physical properties required for the member to be replaced. Alaska or Port Orford cedar may be substituted for any planking species except mahogany presently noted on the applicable drawings. 583-12.3.6.2 Other Repair Replacement Wood. Sapwood in any species should be excluded. When it is impossible to exclude all sapwood in the finished replacement member, the sapwood face or edge should not be placed at a faying surface. Red oak has inferior decay resistance and is not suitable as replacement material unless it is pressure-preservative treated. Distinguishing red oak from white oak and sapwood from heartwood is sometimes difficult. Guidance based on physical features and on the use of chemical indicators is given in NAVSEA 0900-LP-015-1010. In regard to plywood, paper overlayed panels, MIL-P-18066, class 3, are preferable for external painted components, especially horizontal ones where checking is normally a problem with conventional Douglas fir plywood. The moisture content of all replacement lumber shall be 13 + 3 percent at the time of installation. The moisture content of all replacement plywood shall be 10 + 5 percent at the time of installation. 583-12.3.7 PRESERVATION TREATMENT OF WOOD. Type A or B preservative solutions according to MIL-W-18142 (type A, NSN 6840-00-281-2724 or type B, NSN 6840-00-281-2718) shall be used for brush, dip, or soak treatments. The precautions listed in the specification shall be observed at all times. 583-12.3.7.1 Soaking Replacement Wood. All replacement lumber except cedar, teak, cypress heart-wood, and those items listed herein, should be soaked for 10 minutes in preservative after all boring, shaping, and fairing have been completed. Cedar, teak, and cypress heartwood require no treatment. 583-12.3.7.2 Plywood. All plywood subjected to a high decay hazard, such as that used for subdecking or such as that evidenced by decay during repair to active boats, shall be pressure treated according to MIL-P-l9550. All other plywood, except as noted herein, should be soaked 10 minutes in preservative solution. All lumber and plywood surfaces receiving a bright finish and those components not subject to decay, such as doors, tables, and cupboards, require no preservative treatment. Overlayed plywood should be brush treated on the edges and ends only if the particular application does not warrant pressure treatment. 583-12.3.7.3 Untreated Surfaces. The untreated exposed surfaces of any treated lumber or plywood which requires further cutting, boring, or fairing, shall be liberally brushed with preservative. Unpainted surfaces of original material exposed during repair are to be similarly treated. Retreatment of the outer hull up to the sheer line shall not be required directly beneath installed guardrails. 583-12.3.7.4 Drying Treated Surfaces. All treated surfaces should be allowed to dry thoroughly before painting. Drying time normally requires 24 to 72 hours depending on the treatment used and weather conditions. 583-12.3.7.5 Laminated Members. All laminated members should be end-coated with brush applications of wood preservative if their shape is such that they cannot be fully treated by soaking. 583-12.3.8 BEDDING COMPOUNDS. Bedding compounds should be used on all faying surfaces where watertightness is mandatory and on frame and stem ends, beneath guardrails, moldings, and armor plates after the initial preservation treatment. Heavy applications of bedding compound should be used and the resulting squeezeout should be sufficient to assure that no voids remain between faying surfaces. Comb spreaders with a tooth length twice the intended thickness of the compound layer and with a space between adjacent teeth equal to the intended thickness of the compound layer are helpful for correct application. Often, strands of cotton wick-ing, laid intermittently along the coated surface, will assure that some of the compound will remain after the faying surfaces are fastened. 583-12.3.8.1 Watertight Barrier Material. MIL-S-19653 type 1 (NSN 8030-00-579-8891) is an oil-based material which stays permanently tacky. It has given good service and is particularly useful for bedding items which may have to be removed or repaired often. 3M Co. Scotchseal 5200 is a synthetic rubber type that has good adhesive strength as well as water resistance. It forms a good watertight barrier and increase structural strength due to its adhesion (for example, double planking) but makes disassembly more difficult. 583-12.3.9 FLOTATION MATERIAL. Improper installation of flotation material in boats can accelerate and invite decay. In boats with side decks, slats should be installed on the underside of beams and the inboard face of the flotation material. Sheathing should stop outboard of the deck headers about 1-inch or a minimum of two 1-1/2- inch holes should be bored through the flotation material and its cover sheathing to the space between the beams. 583-12.3.9.1 Boats Without Side Decking. In boats without side decks, the flotation material should be fitted closely between frames and should be cemented firmly to the planking. A skin coat of adhesive should be applied to all wood surfaces before placement of flotation material. A heavy brush coat of adhesive shall be applied to the contact surfaces of the flotation material. 583-12.3.9.2 Securing Flotation Material. Suitable furring shall be installed for attachment of sheathing used to restrain flotation material. The sheathing should be 1/4-inch plywood or 1/8-inch masonite. Shoring or clamping of flotation material, while awaiting the bond to cure, is unnecessary with the proper adhesive, providing open assembly time requirements are followed (refer to paragraph 583-12.3.15.7 and 583-12.3.15.8). 583-12.3.9.3 Passenger-Carrying Boats. All fiber-glass passenger-carrying boats shall have flotation material installed. Copies of applicable drawings for such installation are available upon request. 1. Number 10 canvas should be laid in a thick heavy paint coat conforming to DOD-E-24635, formula 20 (NSN 8010-00-286-9083), and should be given a coat of canvas filler followed by two coats of deck gray formula 20. 2. Edges of canvas should be well covered and no portions should be subjected to sharp corners beneath moldings or elsewhere. Moldings should be screw-fastened, properly angled, and bedded in MIL-S-19653, type II (NSN 8030-00-579-8891) compound. 583-12.3.10.1 Glass Cloth Covering. The use of glass cloth coverings for hulls and caulked decks of wood boats is restricted and shall not be applied without prior PEO CLA (PMS 325) approval. 583-12.3.11 ELECTROLYTIC CORROSION. Dis-similar metals should not be joined, but where this is unavoidable, electrolytic corrosion shall be prevented, as far as practical, by insulating the metals from each other (refer to NSTM Chapter 631, Volume 2, Preservation of Ships in Service - Surface Preparation and Painting ). It is important to remember, as far as wooden hull fasteners are concerned, that wood builds up a certain amount of salt concentration over a period of years. Salt affords decay protection but increases the conductivity of the wood. Many reports show that both galvanized and brass fasteners deteriorate rapidly. This deterioration is especially noticeable beneath fenders and in some woods such as white oak, Douglas fir, and mahogany. For wood boats, silicon-bronze fasteners shall be used. The foregoing applies only to fasteners for items, such as engines or winches, to wood components for which fasteners of other material may be required to provide the necessary strength. For non-magnetic minecraft, fasteners used for the hull structure and attaching engines and other equipment, shall meet the nonmagnetic requirements noted in applicable drawings. 583-12.3.12 PAINTING AND SCRAPING. Instructions regarding scraping and painting of wooden boats are contained in NSTM Chapter 631, Volume 2 , and paragraph 583-12.3.14. Plywood surfaces shall not be prepared for painting by sandblasting. Sanding shall be done with care to avoid destruction of outer ply. Plywood having resin-impregnated paper faces shall not be sanded. 583-12.3.12.1 Bottom Paint. Shipborne or non-shipborne type boats assigned to shore activities shall have antifouling bottom paint renewed at 6-month intervals in northern waters and at 4-month intervals or more often, in tropical waters. 583-12.3.12.2 Exposed Wood in Machinery Spaces. To prevent oil from being absorbed into wood in bilges and to provide fire retardancy, all exposed wood in machinery spaces should be coated with an intumescent paint. Surfaces should be cleaned to remove grease, oil, dirt, fuel, and other contaminants. Solvent emulsion (NSN 7930-00-249-8036) is recommended.